During Art.Downtown last weekend, SiTE:LAB, the volunteer-run organization that mounts exhibitions of local and student artwork in unused urban spaces, presented a project in South Division’s historic Harris Building. Consisting of performance and installation, the show presented a fascinating narrative drawn both from the history of the space and fictions layered on by the artists. SiTE:LAB at the Harris Building is an exciting progression of this young organization’s ability to address unique exhibitions sites. At times, the specific histories of the sites SiTE:LAB uses seem only to serve as a more rich background than a traditional white cube (which is not a bad thing, per se). Or in the case of Michigan: Land of Riches, another show curated by SiTE:LAB’s Paul Amenta in the unused and slightly dilapidated former home of the Grand Rapids Public Museum, a technique of direct reanimation of the museum space was used. Artists’ interventions in that show ranged from critical re-imaginings of museums as arbiters of science and history, to jokey appropriations of the stuff they found lying around. With the Harris building project, the overall approach is more consistent: artists are both reanimating the specific history of the space, and blending it with a mythology of their own invention. The line between history and fantasy is intentionally blurred, which is a great move on the part of the curator and artists. This keeps the viewer suspended between a place of soaking in information from an exhibition they believe to be true, and enjoying a fiction they know to be false. The whole show finds its power by playing in this liminal space. For those who didn’t see it, or see all of it, I should explain what was on display. As you entered the space from Division Avenue, you climbed a flight of stairs to the main floor. 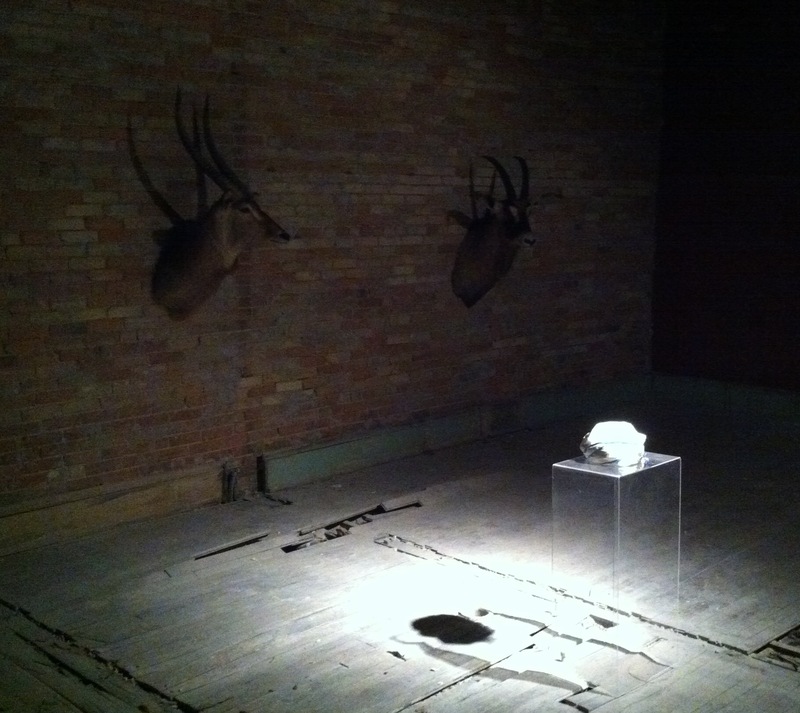 Small installations and tables were placed through space, the floors were dusty wood and the walls were raw brick. Lighting was limited, and gentlemen in blue uniforms complete with epaulets and silver pickelhaube-style helmets milled about. 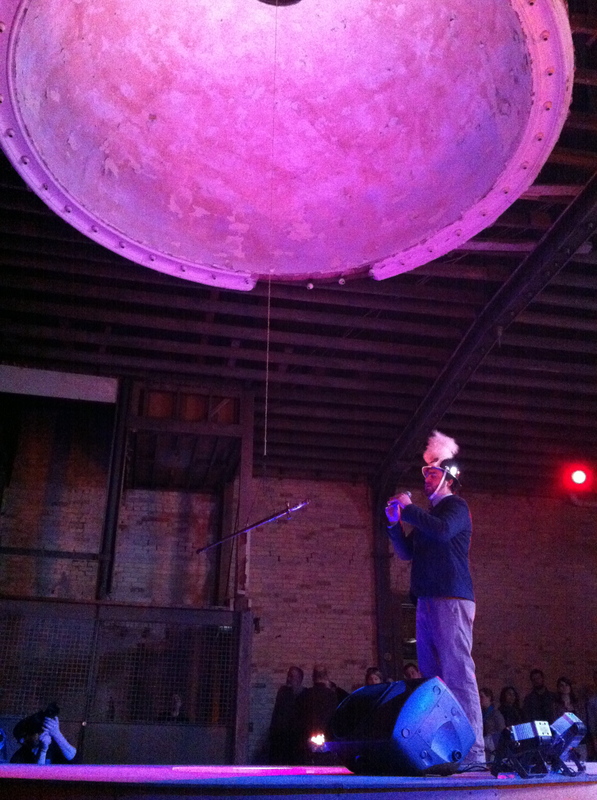 At the back of the space was a large ballroom with a dome in the middle of the ceiling above a circular stage. On the third floor (which was very hard to get to, due to long lines caused by fire code limitations) were installations by various artists and student groups. The works were each confined to a room demarcated by the decaying studs that remained of what used to be walls. This show’s successes and failures both hinged on the same thing: the artists’ ability to create an atmosphere that held you in that space between history and myth. When it worked, the effect was breathtaking, when it failed, it was a little disappointing. The first work I spent time viewing was the performance directed by Austin Bunn. At the sound of a whistle, the costumed guards assembled around the stage. One guard climbed the stage, stood next to a sword suspended on a chain, and sung an incredible song, something between a chant and a Muslim call to prayer. The crowd fell silent and turned to watch. Until that moment, I thought it was curious that a space that large hadn’t been used for installations. Apart from the bar and stage, it was nearly empty. As soon as the song started, the space was filled with sound, anything else would have been a distraction. After the singing, an older gentleman took the stage and welcomed us to a meeting of the Knights of Pythias. The Knights of Pythias are real fraternal order whose Grand Rapids chapter was once the in Harris Building (the triangle window on the the facade is the mark of the Knights of Pythias). As the narrative unfolded, the mood set by the singer began to break. The tone became jokey as the man explained that the lodge was to be inspected by a Pythian of royal descent. The play took a long intermission when this inspection happened, and when the melodrama resumed we saw that the lodge was found wanting, and our local leader must be publicly beheaded. At this point the sword was draw, and the severity of the drama established began to ratchet back up. It may have had something to do with the fact that a lot of children in the audience were screaming. Just in time, the sword is stayed by a mesmerizing dance by a group of women white dresses who seemed to be playing vestal virgins of some sort. * During the dance, and the solo song performed by one of the women following the dance, the full dramatic power of the opening song was brought back to the space. Walking into an abandoned building always has a tinge of supernatural aura. Who was once here? What did they do? Does some echo of those individuals remain? The song and dance performances in the ballroom space tuned into this aura and amplified it in a way that was truly remarkable. The performance ended with a dance by a man in a suit and a large mask resembling a ram’s head. This was a little bit funny, but also disturbing enough to keep the sharp, ritual-like tension in tact. On the third floor, the quality of the installations varied. In one room, I felt completely attune to an environment that seemed unmoored from space and time, and in the next I was pulled right out. RELIQUARY, a dark room of votive sculptures housed in rough boxes, created by students at Aquinas, was particularly effective. 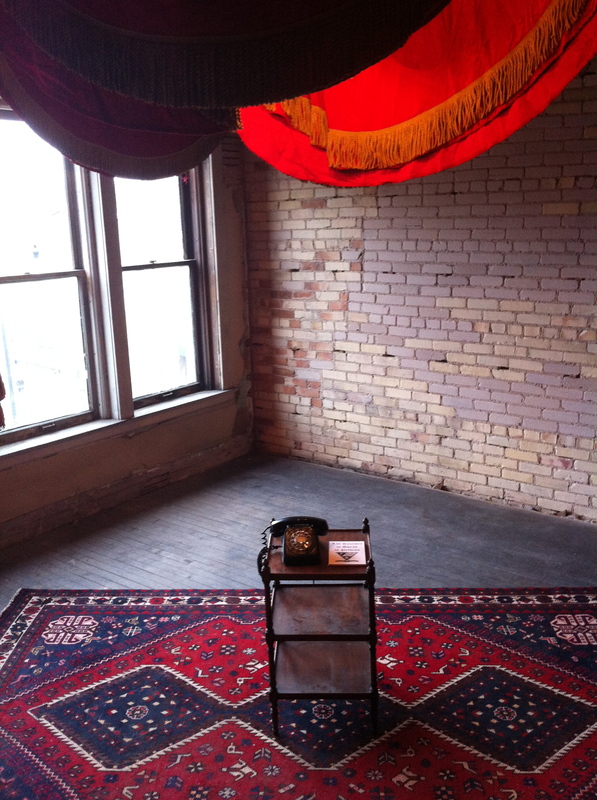 I also really admired ALTAR, by Rob Peterson, a period-perfect installation consisting of a dusty rotary phone on a small table in the middle of a worn Oriental rug. When you picked up the phone, you heard the ramblings of “Pythias” himself. Other installations failed mostly because of the materials they used. One room was dedicated to bundles of rolled architectural renderings. 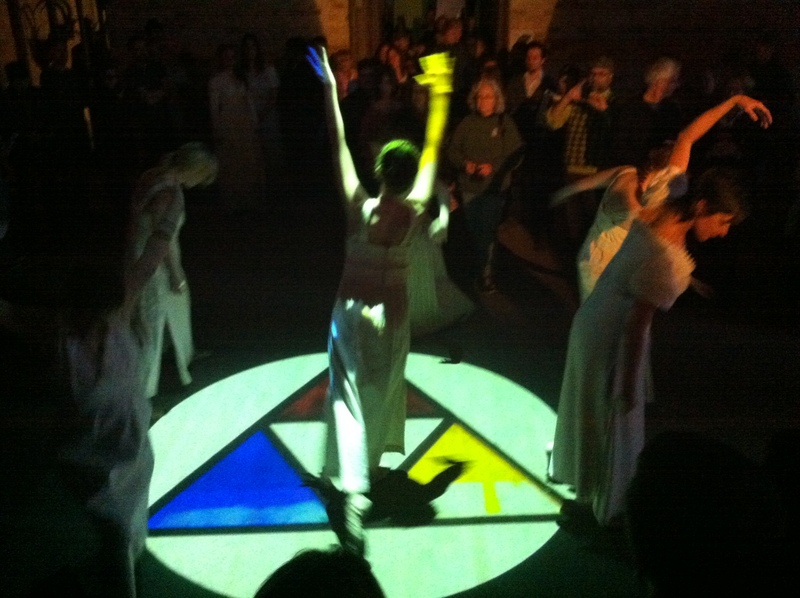 A table in the center of the room featured a video projection of hands shuffling the renderings, shining down from above. Nothing kills the suspension of disbelief you get from feeling like you’re walking into history like the acrid, pixel-y light of a digital projector. More than one installation committed this sin. Overall, the exhibition was a great success. The integration of theater, music, and dance into the SiTE:LAB approach, while not perfect, was a tremendously encouraging step in expanding what this organization is capable of. I’m thrilled wondering what’s next. More site-specific theater? Concerts in secret abandoned buildings? A collaboration with the Grand Rapids Symphony? *The dance was choreographed by Amy Wilson, performed by Dance in the Annex. thank you Kevin for the thoughtful review — I was hoping for just this kind of critical dispatch. I can’t take too much credit; the names people need to know are Seth Galligan (who sang the extraordinary opening chant), Amy Wilson and Dance in the Annex (who were the amazing “vestal virgin” dancers), and Hannah Rose Graves (who sang her original song). Joe Anderson and Craig Powers played the other two roles in the show, and Christian Vigrass was the Man Ram (or Pythias 0). Like thousands of my fellow Grand Rapidians, I delighted in the art and ambience of Art Downtown on April 13 – especially the ambitious project Paul Amenta, Tom Clinton, and a host of dedicated volunteers prepared and curated at the old Harris Building on S. Division. And I enjoyed many of the same performances and installations that you did Kevin, but I feel your review mis-interprets the goal of SiTE:LAB and installations in general. The artists who participated were charged with creating original installation work that responded to the building’s history and the narrative sketched out by playwright Austin Bunn, not to create a uniform historical illusion. To fault artwork for the “sin” of “kill(ing) the suspension of disbelief” with digital projections is akin to faulting the performers for using spotlights to illuminate the stage. Video, a well-respected tool of contemporary visual art and a medium of illusion (projecting just light and not a physical object) is the perfect medium for alluding to the past and hence the ghosts of the previous inhabitants of the building. The Archive Room, which you mention in your review, was not “dedicated” to architectural renderings, but to the activities of the hands in the video in which the men and women are arguing over the Pythian Principles enumerated on parchment. If SiTE:LAB and Art Downtown is to be criticized in any fashion, perhaps it would be for creating an atmosphere that does not invite close viewing and careful examination of the substantial work created by our local artists. Performance and spectacle are well and good, but please allow for an audience that prefers to engage with the cerebral work also.